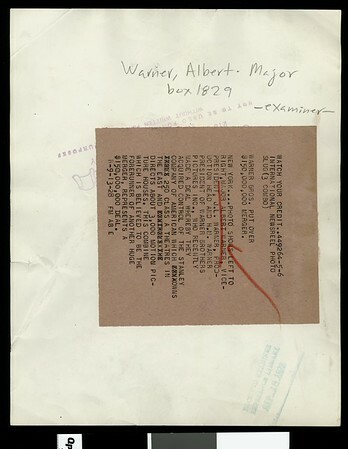 Photographs of Major Albert Warner, J.L. Warner and H.M. Warner. " Watch your credit | 449264-5-6 | International Newsreel Photo | Slug (3 combo) | Warner Brothers put over $150,000,000 merger. | New York ... Photo shows left to right, Major Albert Warner, vive-president, J.L. Warner, production head and H.M. Warner president of Warner Brothers Inc., who recently made a deal whereby they acquired control of the Stanley Company of American which owns 250 class A theatres in the East and directs about 3,000 motion picture houses. This combine which is believed to be the forerunner of another huge merger, represents a $150,000,000 deal. | R-9-13-28 | FM AB E" -- typed note attached to verso.